This is the best subcompact crossover for you if you’re feeling adventurous. You don’t have to actually be adventurous, of course, but Crosstrek’s go-anywhere attitude — backed by genuine off-road ability – gives this little four-door wagon a measure of personality missing in most rivals. It’s a formula that’s elevated Crosstrek to the top of the subcompact-crossover sales charts. Demand is up an astonishing 68 percent through May 2018, outpacing the rapidly expanding segment’s 43-percent growth. The 2019 Crosstrek is little changed after a full model-year-2018 redesign. Subaru does expand its EyeSight safety system for ’19, making it available on the least-expensive Crosstrek trim level and standard on the most expensive. It’s also introducing a plug-in-hybrid variant that’ll be the only subcompact crossover with gas-electric propulsion and all-wheel drive (AWD). Sales of the Crosstrek hybrid, however, will be confined to California and the few other states that share its vehicle emissions standards. Otherwise, the 2019 Crosstrek returns as the automaker’s third-best-selling vehicle, behind its costlier and more family-oriented crossovers, the compact Forester and midsize Outback. Crosstrek’s gas-only lineup consists of the 2.0i Base model, the better-equipped 2.0i Premium, and the flagship 2.0i Limited. At the time of this review, Subaru had not disclosed precisely what it’ll call the Crosstrek plug-in hybrid. It has registered the name Evoltis but hasn’t said if it’ll go on the Crosstrek hybrid, on an all-new vehicle, or become the marketing title for its hybrid or electric technology. Trim levels for the plug-in hybrid were not released in time for this review, either, but at minimum, expect a Premium-grade equivalent. Today’s second-generation Crosstrek built on the success of its model-year 2013-2017 predecessor with a 2018 redesign that brought more sophisticated engineering, a restyled body, and expanded features. It’s No. 1 in sales in a competitive set that includes (in order of sales) the Jeep Renegade, Chevrolet Trax, Honda HR-V, Toyota C-HR, and Mitsubishi Outlander Sport, as well as the Ford EcoSport, Mini Countryman, Nissan Rogue Sport, and Mazda CX-3. Also in the segment is the Hyundai Kona, which for model-year 2019 adds the Kona EV, a pure-electric model with no gas propulsion – and no AWD. Styling: The look that came with the model-year-2018 redesign is unaltered and unlikely to change before Crosstrek’s midcycle freshening, probably for model-year 2021. (The 2019 hybrid gets its own visual touches). Crosstrek absorbed the sharper edges and brand cues first seen on Subaru’s 2017 Impreza compact car. Crosstrek in fact looks much like an Impreza hatchback, which essentially it is. It acquires its own personality, though, via contrasting-color lower-body cladding and a suspension raised to provide 8.7 inches of ground clearance, an elevation matched in this class only by the Jeep Renegade Trailhawk. Styling details of the Crosstrek plug-in hybrid were not released in time for this review. Expect subtle visual touches, including a second fuel-filler-type door for its plug-in-charging port. The hybrid will have customized instrumentation to display state of charge, range, power flow, and related data. But its dashboard will retain the same pleasingly functional layout of the other Crosstreks. Base and Premium have Subaru’s Starlink multimedia system with a 6.5-inch central dashboard screen supporting Apple CarPlay and Android Auto. The Limited’s Starlink Multimedia Plus system has an 8-inch display and is the only version that can be upgraded with imbedded navigation. The Limited is also the only Crosstrek with leather seating surfaces, although upholstery and interior plastics on all models beat most in the segment for fit, finish, and quality. All Crosstreks have roomy front bucket seats. Rear passengers enjoy better-than-class-average legroom but taller folks will wish for more headroom and a bench with better thigh support. Numerous generously sized pockets and bins are a cabin highlight. Cargo volume is above average for the segment. 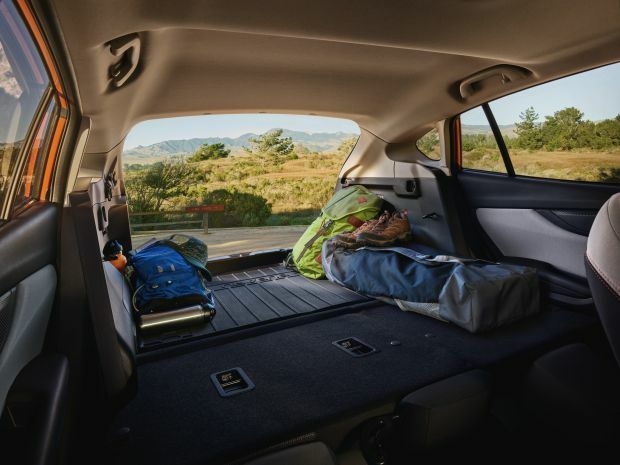 Despite shrinking 7 percent in the 2018 redesign, cargo volume is still a liberal 20.8 cubic feet behind the rear seat. With the 60/40 split seatbacks folded, it’s 55.3 cubic feet, a 6.5-percent increase over gen-one. Mechanical: No changes for the gas-only Crosstrek. The 2.0i models share a single engine, a 2.0-liter with four horizontally opposed cylinders. Relatively compact and boasting a low center of gravity, this “boxer” design is a Subaru signature (the new midsize Ascent 8-passenger crossover uses a turbocharged 2.4-liter boxer four). Crosstrek’s naturally aspirated 2.0-liter was upgraded to direct fuel injection in the 2018 redesign and gained 4 horsepower, for a total 152, while retaining 145 pound-feet of torque – output that’s par for the competitive set. The 2.0i Base and 2.0i Premium models are among the precious few crossovers or SUVs available with manual transmission, here promoted to six speeds from five in the ’18 redesign. 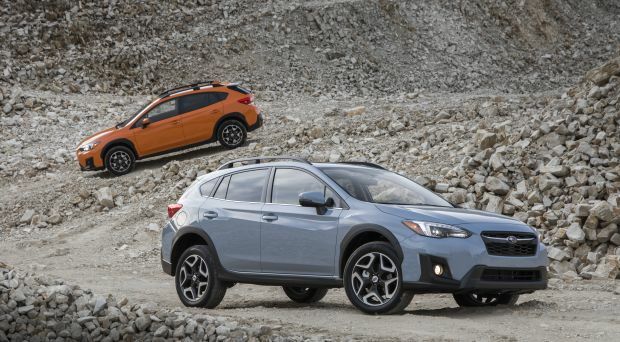 Most Crosstreks, however, are sold with the continuously variable automatic transmission that’s standard on the 2.0i Limited and a $1,000 option for the other 2.0i models. This CVT is calibrated to mimic the stepped gear changes of a conventional automatic, and Premium and Limited grades get paddle shifters for a semblance of manual-type control. Ultimately, though, the CVT is a wet blanket on performance. It neuters throttle response and lets the slightly coarse-running engine drone intrusively during acceleration. The six-speed manual is more fun but can’t improve Crosstrek’s mediocre acceleration. With either transmission, it’s advisable to plan carefully when merging or passing at highway speeds. Happily, ride and handling require no qualifiers. The 2018 redesign brought a notably rigid new substructure that teams with astute suspension tuning to bless the Crosstrek with impressive composure. It’s absorbent on sharp ridges and big ruts and remains faithful to your line even through bumpy turns. Steering feel is firm and natural, and active torque vectoring is standard to help you change direction with confidence. Crosstrek is a determined little burro off road. Plentiful ground clearance is an asset, as is Subaru’s standard AWD, which maintains a 50:50 front/rear torque split on manual-transmission versions and automatically varies torque on CVT models. CVT-equipped Crosstreks benefit additionally from Subaru’s X-Mode, activated at the push of a button to imitate tenaciously effective low-range gearing. Hybrid-powertrain details were not released in time for this review, but Subaru is sharing some components with Toyota, which offers plug-in technology in its front-wheel-drive Prius Prime hatchback. The Subaru system will draw an initial battery charge from a residential or commercial outlet that’s sufficient to drive solely on electricity for limited distances. Initial charge expended, the Crosstrek plug-in will become a conventional hybrid. Sensors will determine the ideal mix of gas and electric power and the battery will recharge via regenerative braking and coasting. AWD will be standard and may be provided by a rear axle fitted with its own electric motor for power automatically, as required. Features: The 2018 redesign comprehensively upgraded Crosstrek’s features, but credit Subaru with some thoughtful tinkering for 2019. The highlight is expanded availability of its EyeSight driver-assist system to the 2.0i Base model – although only as an option in tandem with the CVT. EyeSight remains an option for the 2.0i Premium grade – again only with the CVT — but for ’19 becomes standard on the 2.0i Limited. This important driver assist includes autonomous emergency braking that can automatically stop the Crosstrek to mitigate a frontal collision. It also features adaptive cruise control to maintain a set distance from traffic ahead, as well as lane-departure warning with automatic steering correction. The EyeSight option adds a reasonable $845 to the CVT-equipped 2.0i Base model. It costs $1,395 on the CVT-equipped 2.0i Premium, where it also includes useful blind-spot and rear cross-traffic detection. Previously a $2,095 option on the 2.0i Limited, the flagship’s now-standard version of EyeSight is accompanied by reverse autonomous braking and by steering-linked LED headlamps with automatic highbeams. Blind-spot and rear cross-traffic detection remain standard on the 2.0i Limited and unavailable on the 2.0i Base model. Any EyeSight-equipped ’19 Crosstrek features an individual-tire-pressure display. In addition to the aforementioned safety, connectivity, and mechanical features, the 2019 Crosstrek 2.0i Base model returns with 17-inch alloy wheels, roof rails, and understated but sharp-looking black simulated carbon-fiber cabin accents. The ’19 2.0i Premium trim again builds on that with fog lamps, heated front seats and mirrors, a leather-wrapped steering wheel with orange stitching, a windshield wiper de-icer, a sound-insulated windshield, a retractable cargo cover, and welcome lighting. For ’19, the 2.0i Premium’s 6.5-inch-screen multimedia system gains some Starlink Multimedia Plus features, including satellite radio and a single-disc CD player. 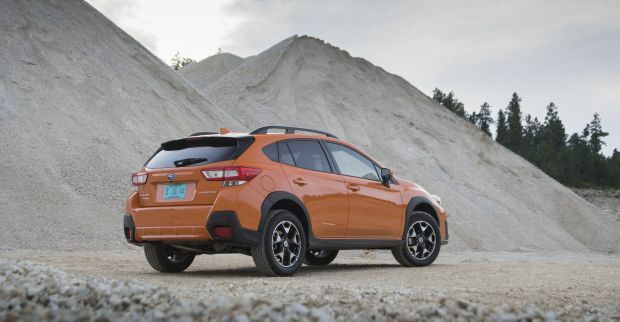 The ’19 Crosstrek 2.0i Limited again gilds the Premium model by adding the 8-inch Multimedia Plus system with voice-activated controls, plus 18-inch alloy wheels, orange-stitched leather upholstery, keyless access with pushbutton ignition, a power driver’s seat. In addition to its unique powertrain-related features, expect the 2019 Crosstrek hybird’s standard and optional equipment to mirror that of its 2.0i trim-level counterpart(s). Credit Subaru with keeping Crosstrek’s base-price increases modest for 2019. The 2.0i Base model climbs just $100 with manual transmission and $160 with the CVT. The 2.0i Premium starts $360 higher than before with either transmission. And the 2.0i Limited’s base price increases a reasonable $960, despite gaining as standard EyeSight, reverse automatic braking, and the LED headlamps. Overall, ’19 Crosstrek pricing is competitive with AWD versions of most rivals. Note that base prices in this review include Subaru’s $975 destination fee (it was $915 for 2018). Base price for the ’19 Crosstrek 2.0i Base trim is $22,870 with manual transmission and $23,870 with the CVT. For the ’19 2.0i Premium, prices start at $23,870 with manual and $24,870 with the CVT. Base price for the ’19 2.0i Limited, with CVT standard, is $28,170. As for options, a package that includes EyeSight, a moonroof, and blind-spot and rear cross-traffic detection adds $2,395 to a 2.0i Premium with CVT; without EyeSight, the package is $1,400. The moonroof is a $1,000 stand-alone option for the 2.0i Limited, which can also be ordered with a $2,350 package that combines the moonroof with imbedded navigation and a premium Harman Kardon audio system. Even with no options, the ’19 Crosstrek 2.0i Limited is pricey for this class. It’s about as expensive as lower-trim-line compact crossovers that don’t feature leather upholstery and may not include autonomous emergency braking but are roomier and more powerful. That describes Subaru’s redesigned 2019 Forester compact crossover, which is usefully larger than the Crosstrek. The unchanged gas-only 2019 Crosstreks repeat model-year 2018 EPA ratings, placing them on par with AWD rivals — although some of those competitors have more power and stronger acceleration. Crosstrek 2.0i models rate 23/29/25 mpg city/highway/combined with the six-speed manual transmission and 27/33/29 with the CVT. The plug-in hybrid’s ratings were not released in time for this review, but an electric-only range of less than 25 miles is a good bet. So is a combined city-highway rating of under 50 mpg in conventional-hybrid mode. The 2019 Crosstrek 2.0i models goe on sale during summer 2018. Release date for the ’19 Crosstrek plug-in hybrid is Fall 2018.